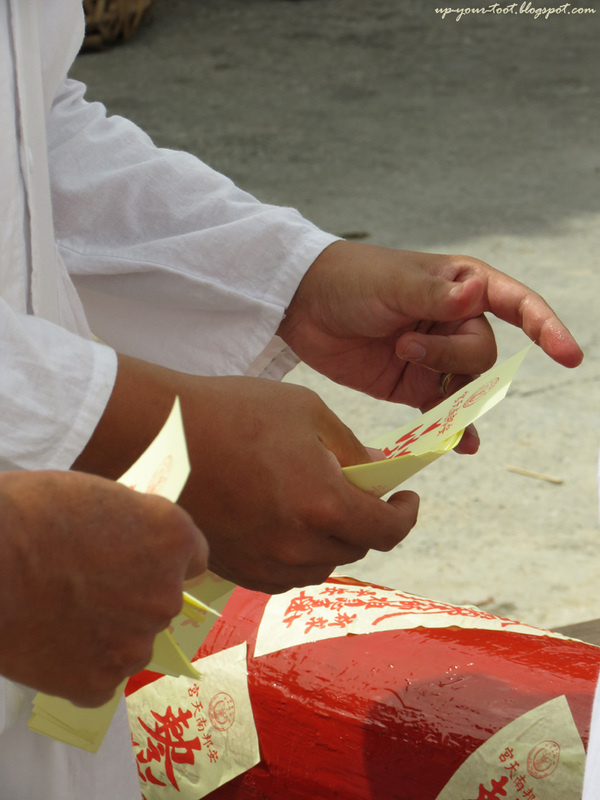 There are two main events on the eve of the Nine Emperor Gods Festival, the first being the raising of the lantern pole and next is the procession to invite the Nine Emperor Gods from a body of water, in this case is the Kosas River. The crane was up and ready by 10am. Got me out of bed real quick. 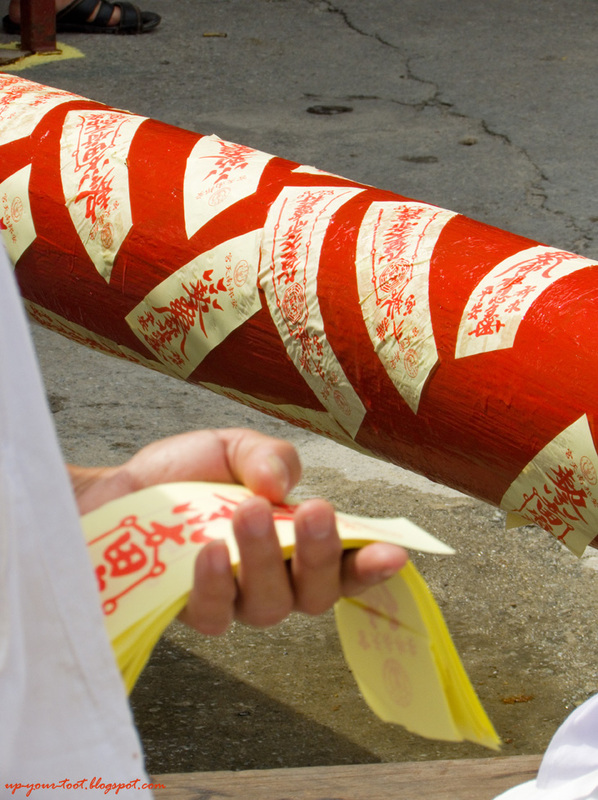 Final adjustments to the lantern pole. 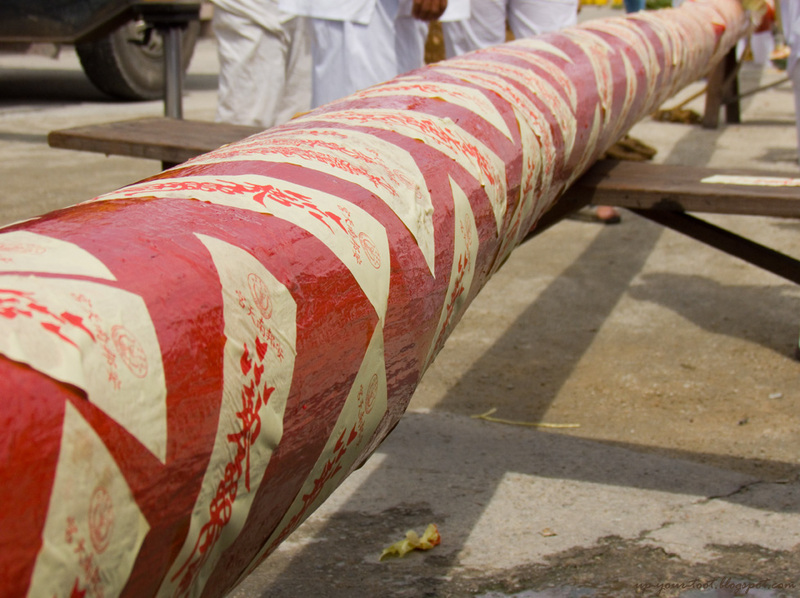 They need to tie up three different sections to make the final pole. 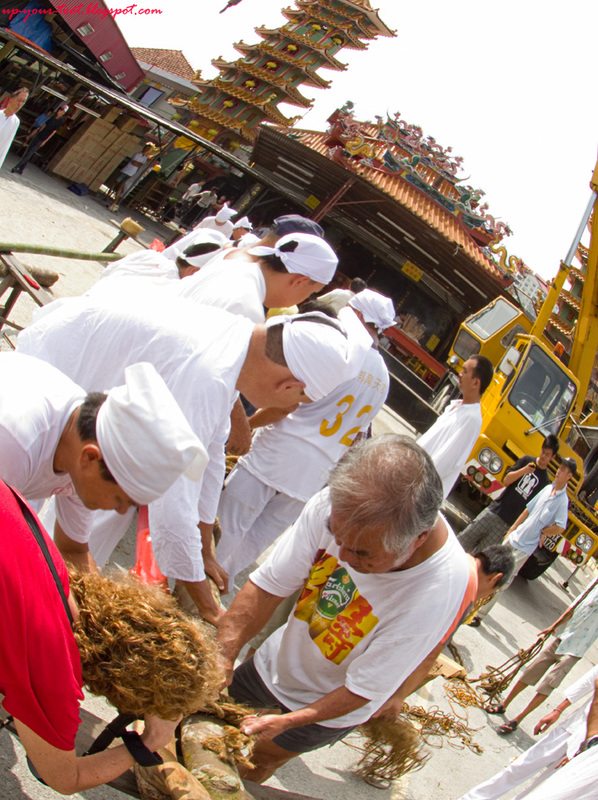 The activity leading to the raising of the lantern pole usually starts around 10am. The crane that will hoist the pole was already there at the compound at10am. 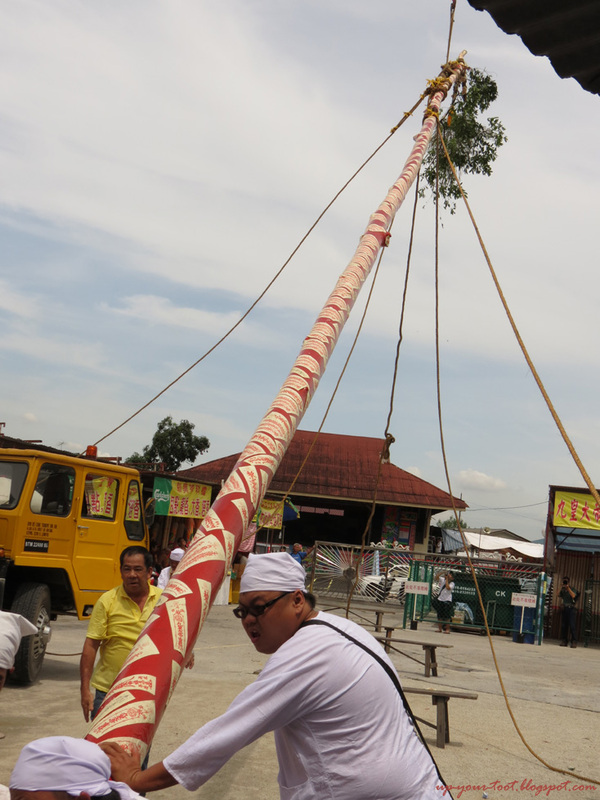 So after a quick brisk walk to get to the temple, I saw that the temple volunteers and staff were making minor adjustments to the various sections of the pole. Men and woman at work. Catching up with old acquaintances. Hmm, vertically challenged = bigger lens??? Putting on divine blessings on the pole. If I stick one on my camera will Nine Emperor Gods make me take better pictures?? Even more talisman for the lantern pole. They were instructed to stick it diagonally and not horizontally with respect to the pole axis. Very quickly the place started to fill up with onlookers and not forgetting the photographers, i.e. the pros. Most of them just go about, taking photos and not talking to the other photographers. But things change when Cheryl Hoffmann (of CJH Photography) turned up. With a friendly smile, her warm and vivacious personality got most of the photographer talking when approached by her. 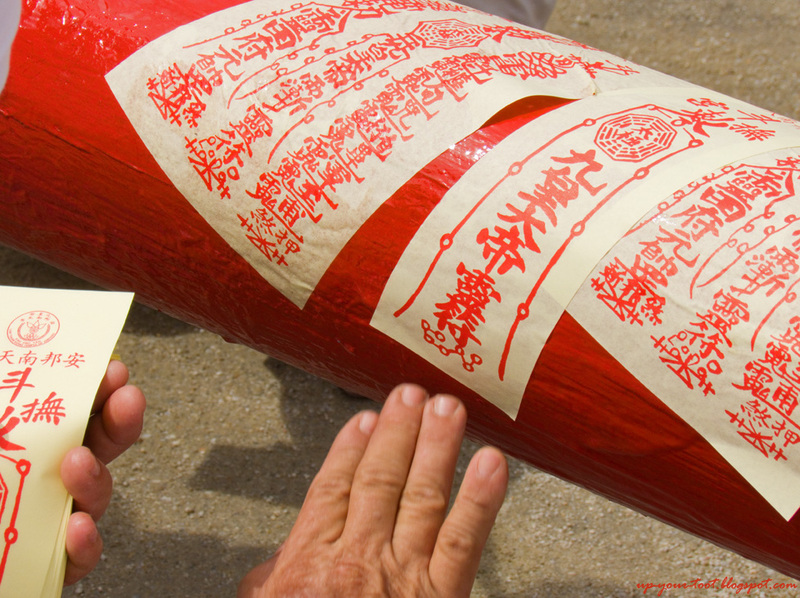 The Nine Emperor Gods' talisman - got UMPPH one you know!. The bigger one has the names of the Big Dipper Stars on it. All ready and well protected from any forces of evil. For me this was the first time we met in person; for though we have exchanged many comments on our blogs, we have yet to meet face to face up till now. 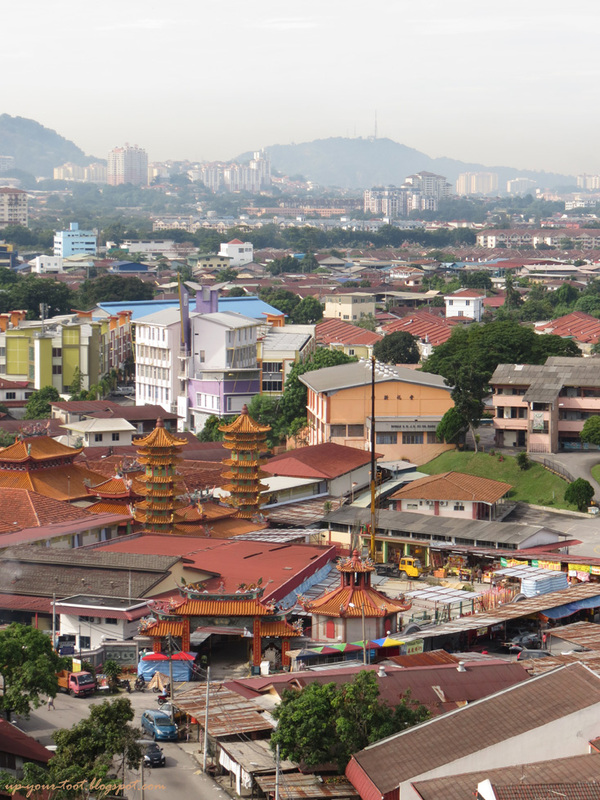 With good knowledge of the Nine Emperor Gods Festival and the willingness to share, she is one person that you should talk to if you are interested to see and get the feel of the festival in Ampang. Even as she was busy between catching up with old friends and taking photos, she still finds time to give me tips on what to snap and how to do it. Doing the Gangnam dance??? Maybe Oppa Kew Ong Yeh Style??? 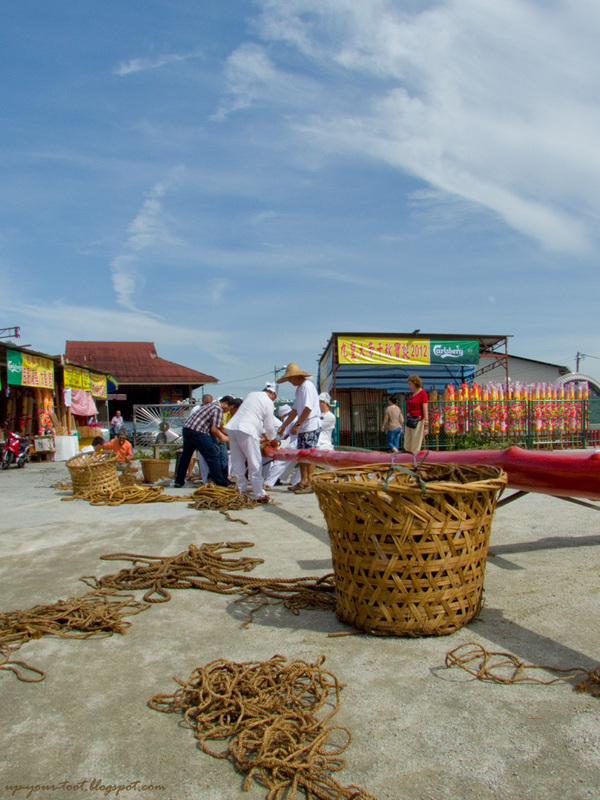 No they were just raising the lantern pole. 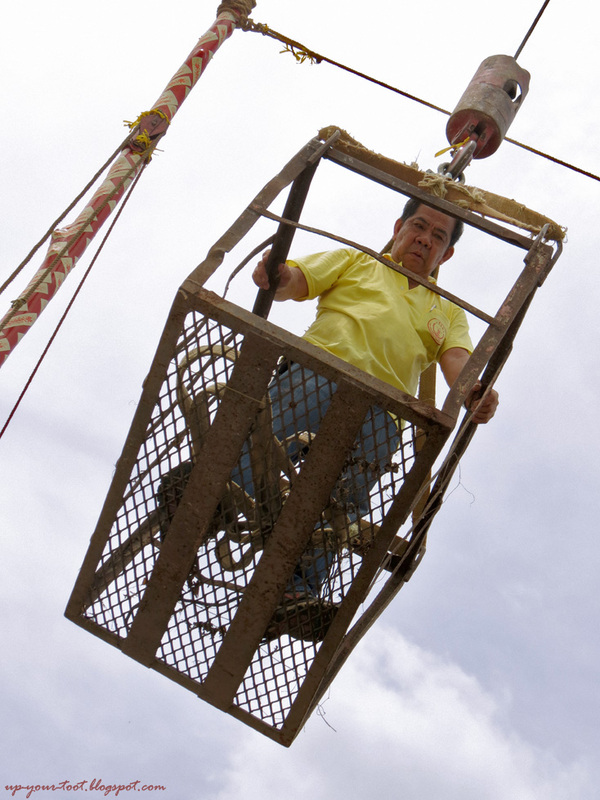 And his face will attest to how serious these men take their work of raising the pole. 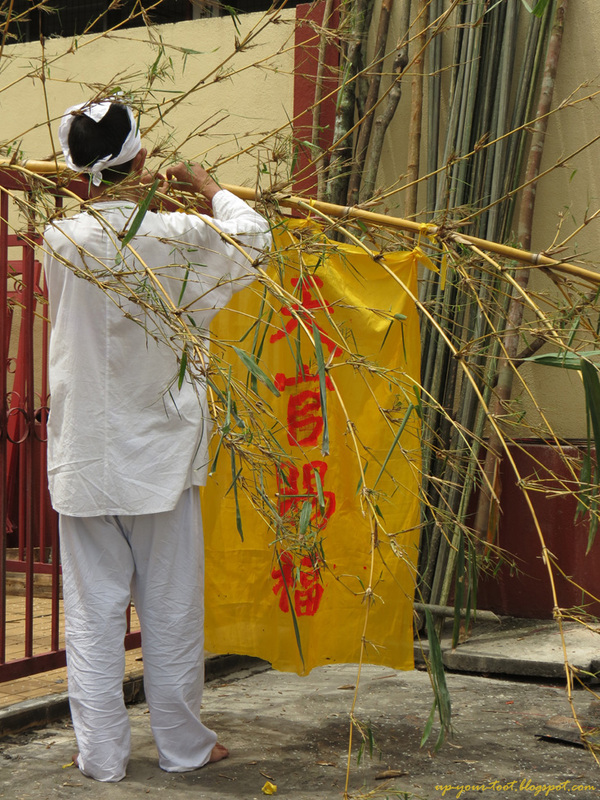 The Tian Guan (Heavenly Officer Who Bestows Luck) Flag being tied to the horizontal bamboo pole. 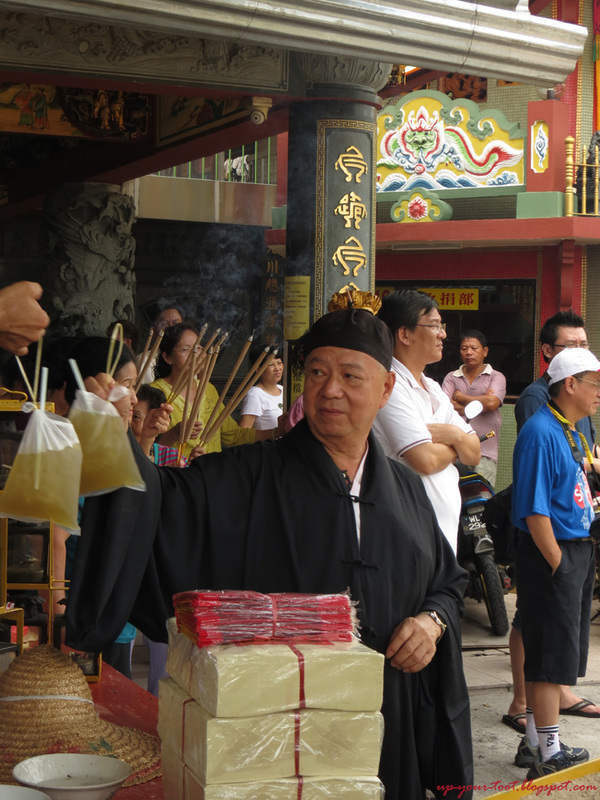 Yam Seng...sugarcane drink for the Taoist priest. 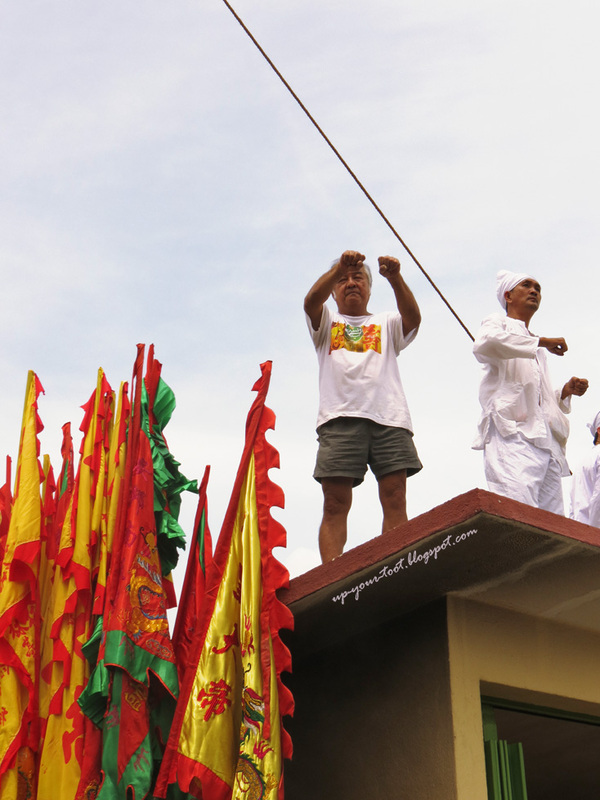 When the pole was finally erected and in place, there was a mad dash for the offerings on the table. As usual, clueless me didn’t get any. The aunties and uncles move like athletes on the Olympic track and field event – in a blink of an eye, the bowls were all empty, save for some grotesque looking black ear fungus. 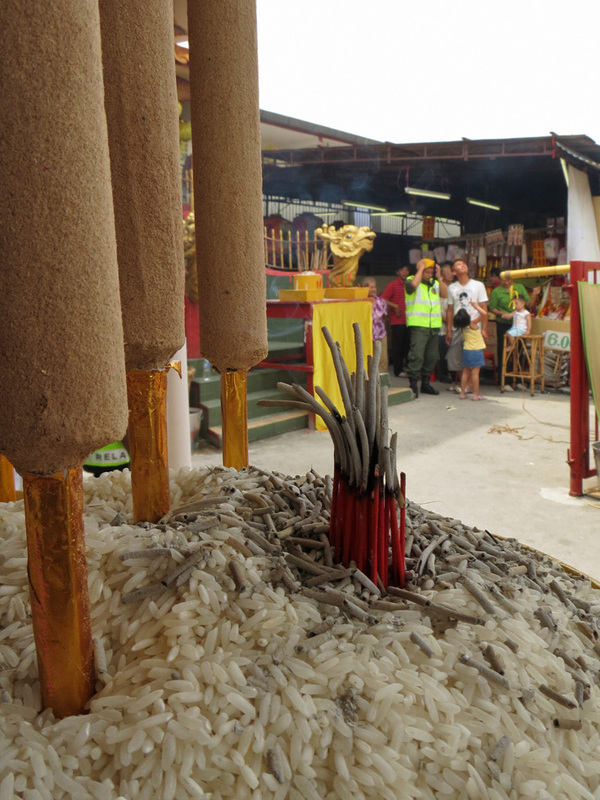 The ceremony took quite a while, so the smaller joss-sticks burnt out. Partaking in the offerings at the end of the ceremony. Even though I was just by the altar table, I didn't manage to grab anything, with my two hands on my camera. I also got a glimpse of the dorms and temple rooms courtesy of Cheryl, as she went to check out her room there. It was an eye opener for me as I traversed through the rooms that would have left me lost had she not been for my guide; for those who are MCG members, do check out her guided tour of this temple here – it is definitely worth it. By the time we left temple, it was almost 2pm, just enough time to get some rest before 5pm when the crowd for the invitation ceremony will start coming in. Catching up with former dorm neighbours. In her own words, it is like summer camp. PS - the post for the invitation ceremony will be a little delayed due to technical difficulties and work schedule. Serves me right for changing camera two days before the event. Not only do I need to get used to the controls (on camera and CHDK controls), my usual Photoshop tricks would have to be tweaked as well. Nice. Event like this make the community closer. Aiya dahaga tengok air tebu tu. I agree. I pun telan air liur bila nampak air tebu tu. Dahlah masa itu panas terik.